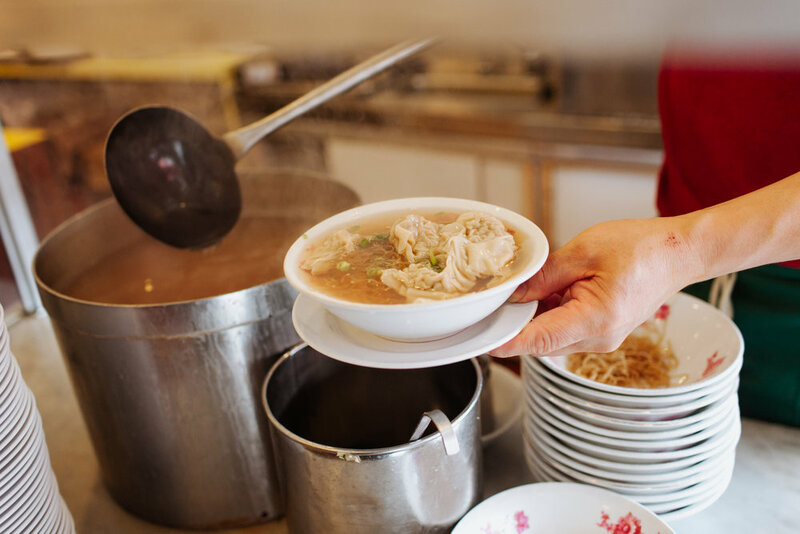 Won ton noodle soup, their signature, is classic Hong Kong fare. Many many dumplings are made by hand daily. Ng Yuen Wah is a Chinese-American success story. She purchased Hon’s Wun-Tun in 2010 after working at the restaurant for 30 years. Prior to being a Hon’s, she had worked and helped open Chinese restaurants in Hawaii, Idaho and Louisiana. 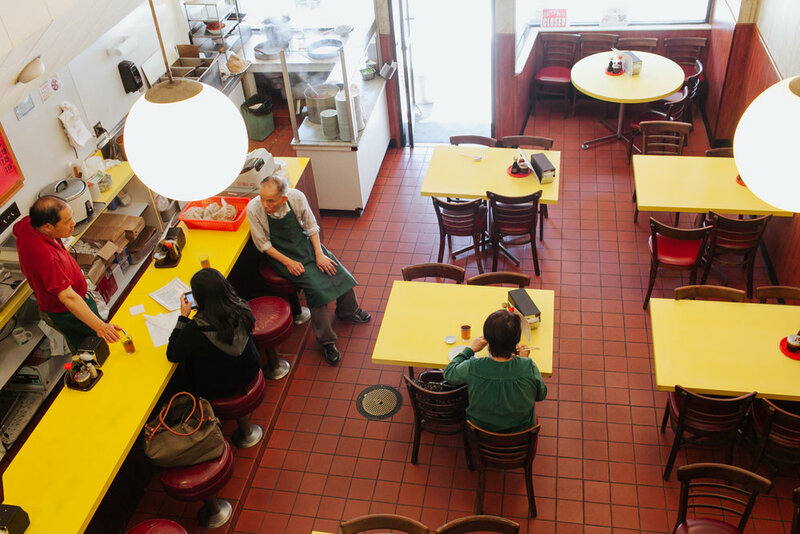 She came to San Francisco in search of a larger Chinese community and landed at Hon’s Wun-Tun House, which focuses on Southern Cantonese cuisine. The space is reminiscent of a Hong Kong-style of eating since it primarily focuses on one dish. On the front window, a red window decal simply says “noodle” in a Chinese character. Their set-up resembles a Hong Kong noodle hustle. 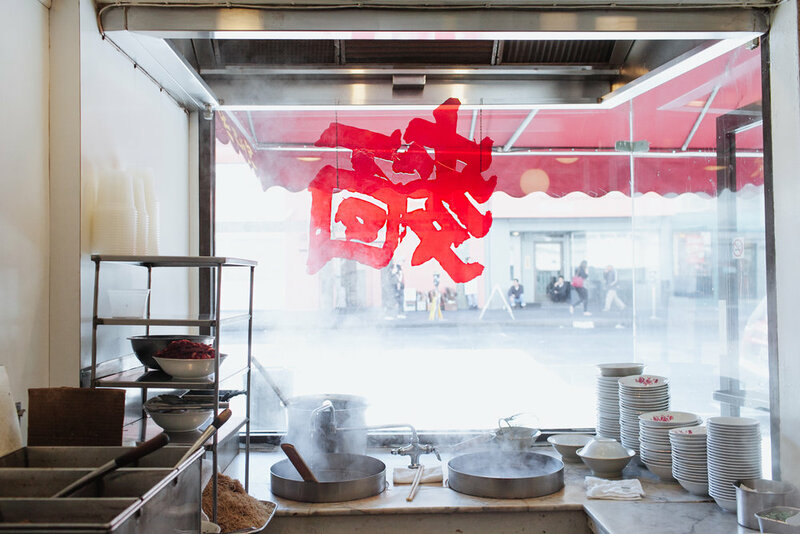 Their noodle station faces Kearny street, where pots of hot water fog up the front window where the cook heats up the noodles and wontons. Ng Yuen finishes off the dish by adding the broth and garnishes on the marble countertop. Their tag-team dynamic allows them to bust out 300 bowls on a busy day. Since the restaurant sits on the border of the Financial District and Chinatown, it’s frequented by both by locals and downtown workers. At $6 a bowl, it makes for an affordable place to duck in for wonton noodle soup on the mostly chilly San Francisco days.